Dimensions W 24" x D 23-7/8" x H 57-1/2"
Two half size ovens. 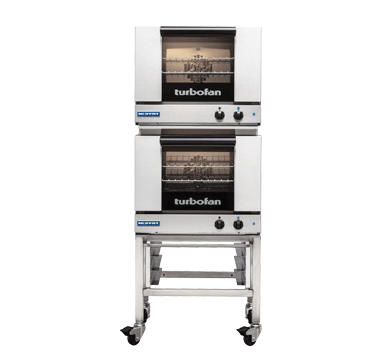 This plug-in utility oven is a convection oven in its simplest form and, with a smaller 610mm / 24″ wide footprint, is double stacked on an adjustable feet base stand for increase production capacity within the same footprint. This allows for baking of morning and convenience foods such as cookies, muffins, Danish pastries, biscotti, breads, cakes, baked potatoes, frozen pizzas and many other snack and takeout foods. 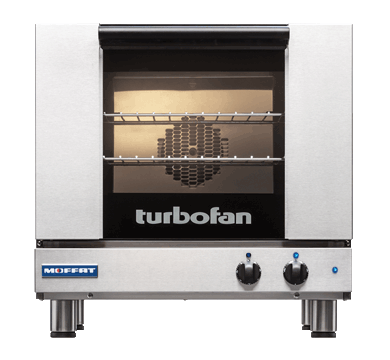 Smart design, with up to 1.5kW of plug-in performance and a single direction fan makes this the easiest oven to use across a wide range of applications. Manual controller interface offers simple and efficient access to high performance power with a mechanical thermostat for time and temperature setting.